Cheetahs are the fastest land animal. They are known for their great speeds, even if they only maintain those speeds in bursts over short spans of time. Cheetahs can run up to 70 miles per hour to catch their prey. There are five subspecies of cheetahs which include the Asiatic cheetah, Northwest African cheetah, South African cheetah, Sudan cheetah, and Tanzanian cheetah. Cheetahs, on average, live between 8 and 10 years in the wild and between 10 and 12 years in captivity. There are a few documented cases of captive cheetahs living to be 20 years old. Cheetahs have long, slender bodies with deep chests. They are typically about three feet tall at the shoulder and can weigh between 110 and 140 pounds. Cheetahs have a yellow or golden coat with solid black spots. Cheetahs are typically solitary animals, however, at times, males will form coalitions of two or three brothers from the same litter. 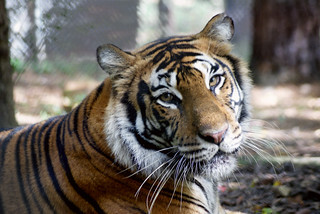 Females are solitary unless they are raising a litter of cubs. Cheetahs hunt mainly on the open or mostly open savannas and plains of Africa and Asia. They use the tall grasses to their advantage to camouflage them from their prey. Cheetahs' numbers over the last couple decades have declined dramatically due mostly to poaching but also to habitat loss. Cheetah fur brings in a lot of money on the black market. 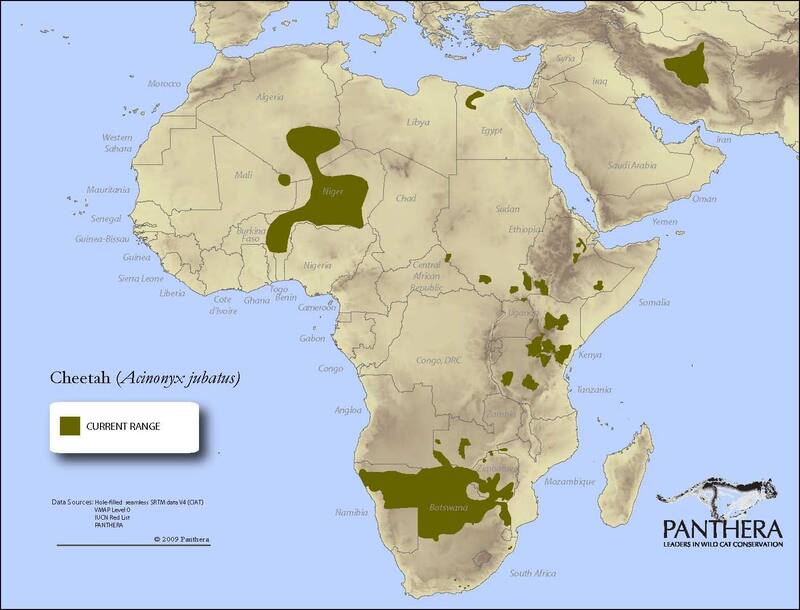 Cheetahs are most prevalent in Africa but only inhabit about 6% of their original range. There is a small population of about 200 cheetahs in Iran and a few in Afghanistan and the Indian subcontinent. Cheetahs prefer to hunt medium-sized prey. They will often go after medium-sized hoofstalk including antelope, impala, and springbok. They have also been known to hunt hares, foxes, and occasionally warthogs. The gestation period for cheetahs is about three months. Females have between two and four cubs in a litter and the cubs stay with their mother until they are about a year old. The mortality rate of cheetah cubs is high. Nearly 83% of cubs die before reaching adolescence. About 77% of those deaths are attributed to lions. When hunting, cheetahs stalk their prey to get as close as they can. When they are able, their method of knocking prey down is to swat at their legs and feet as they run. Cheetahs then suffocate the animal as quickly as possible and eat as much as they can before larger predators come in and steal their food. Cheetahs are typically diurnal, meaning they do most of their hunting during the day. This is not true for most large predators in Africa, who would be considered enemies of cheetahs. Cheetahs are considered "vulnerable" on the IUCN Red List. 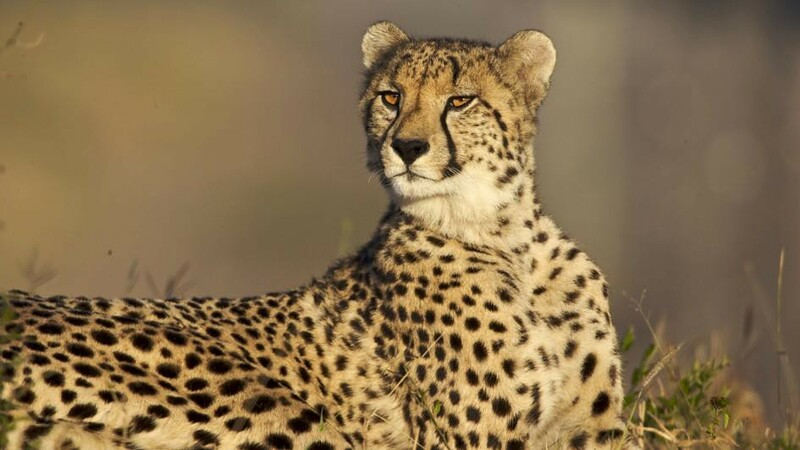 The main reasons for a decline in population are habitat loss and poaching for cheetah pelts.